This past tax season we received many phone calls from clients complaining or concerned about the long length of time it took for them to receive their refunds. The delays in refunds were because of the new steps the IRS took this year to weed out fraudulent refund claims. Counterfeit tax returns occur when a person filing a tax return using a stolen name and social security number of a valid taxpayer or that of a dependent and then claiming that person as a dependent on their return. Typically they will file the returns early in the tax season before the IRS has even received or processed tax documents such as W-2’s or 1099’s; so when the real taxpayer attempts to file their return later in the season they are notified that they are trying to file a duplicate return. This was where e-filing speed up this process for a few of our own clients this year. When you e-file you receive the notification within a day or so; whereas if you paper file you have to wait for the IRS to receive and manually process your return, then also wait for them to mail you a notification. 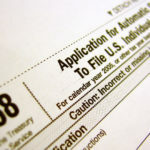 All electronic tax returns submitted to the IRS are tracked by the IP (Internet Protocol) address, date, and time of the computer that submits the return. There is also another form of ID theft that the IRS is warning about, this theft occurs when a person uses another taxpayer’s Social Security number when they are hired for work. Believe it or not there is a black market for valid Social Security numbers that theft’s and illegal aliens use frequently for employment, their wages then being reported under another taxpayer’s SSN. In this case usually the name and the Social Security number do not match, but it takes the IRS a year or more to notify employers of the error and by then the employee is gone. With this form of ID theft it takes a much longer time for the taxpayer to find out their SSN was even being used because typically they won’t be aware of it until they receive a notice from the IRS inquiring why they did not include all the earnings from a prior year. This type of ID theft, known as employment theft, can be much more difficult for taxpayers to resolve with the IRS than a fraudulent tax return because it is the burden of the taxpayer to prove the wages were not theirs, and there is almost always the presumption that information obtained from W-2’s and 1099’s is correct, even if some of the information does not match up. Most people think of identity theft as a stolen credit card or bank account, but many don’t realize that tax identity theft has been increasing in recent years becoming a billion dollar business. The IRS reported tax identity theft as No. 1 on its annual list of tax scams, and has been working to address problems within the tax reporting process to stop thieves from continuing to exploit taxpayers. The IRS is currently testing a barcode system to identify taxpayers in IRS correspondences as well as they have stopped placing full Social Security numbers on some of the notices they mail. If you think you’ve been the victim of tax identity theft please call our office immediately so that we may begin to take action in resolving the issue.